The Sisters of Charity Visit Again. The Sisters of Charity Visit Again! We had a particularly large group yesterday on our play Her Story at the Cascades Female Factory. Some of them appeared to be from a religious order as they wore crosses and head coverings. Sure enough when it came time for Mary to sing “Abide with Me” in the Chapel, our came their song sheets! The Sisters of Charity regularly include Her Story in their itinerary when ever they have visiting personnel. Not only do they enjoy our brilliant play but it echoes their own history when Sisters would walk up the Rivulet to minister to those long ago convict women. Because they are in the “know” they also have the words to the old hymn with them…………. BTW the singing was magnificent and very moving as it bounced off the old convict sandstone walls. 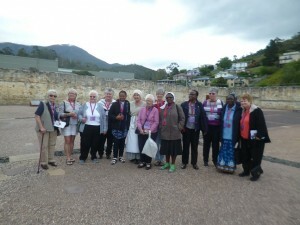 Pictured are Sisters of Charity from around the world; Ireland, Zambia, Nigeria and the USA. Sisters of Charity From Around the Globe.